It's official: Apple iOS 6 is coming this fall," and with it some 200 updates and improvements. Although there's nothing I'd call revolutionary (to me the updates seem more akin to iOS 5.5), Apple has baked in plenty of good stuff for business users -- starting with its homegrown Maps app, which is good news for iPhone owners but bad news for GPS-app developers. Here's a rundown of the most business-friendly features you'll find in iOS 6. 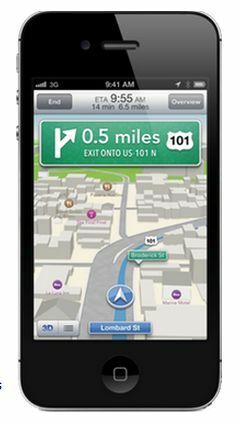 The new Maps app will finally offer something Android users have enjoyed for a while: turn-by-turn navigation. That means your iPhone can steer you from point A to point B without the need for a pricey third-party app. Plus, it'll have Siri integration, so you'll be able to ask for the nearest gas station along your route, find out how much longer your trip will take, and so on. Also coming to Maps: real-time traffic updates, meaning you'll be able to spot trouble areas and possibly even find out what's causing the hold-up (construction? an accident? a cop on the side of the road?). What's especially interesting is that Maps will share (anonymously, of course) real-time traffic data from your phone (and everyone else's), meaning we may finally see a crowdsourced traffic system that works. Whether it actually helps is another story. 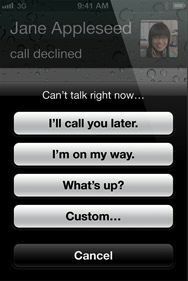 Since the dawn of iPhone time, you've had exactly two options for fielding a phone call: Decline and Answer. In iOS 6, you'll also see these buttons: Reply with Message and Remind Me Later. The former lets you kick back a canned text message (e.g., "Call you later"), while the latter will set a reminder for a callback. FaceTime can be incredibly handy for showing rather than just telling, but because it requires Wi-Fi at both ends, it has limited in-the-field applications. But with iOS 6, Apple is enabling FaceTime over 3G connections, effectively opening the floodgates to what you'll be able to do with it: show a mockup of a new product, report back to the home office from the trade-show floor, and so on. Taking a page from Google's Priority Inbox, iOS 6 lets you designate contacts as VIPs, then filters all messages from those people into a special VIP Mail folder. That should make it incredibly easy to separate the wheat from the chaff, email-wise. Another nice tweak: You can now attach photos or videos to an e-mail from within a new message. No need to hit the Photos app first. Yay! Good news, frequent flyers: This new app keeps all your airline tickets (among other things) in one convenient location. Even better, it's location-aware, meaning your boarding pass will pop up on the lock screen when you get to the airport. It can even update the boarding pass in real time with gate-change information and the like. That's pretty flippin' cool. Okay, iPhone fans, those are iOS 6's most-likely-to-succeed-in-business features. What do you think of Apple's latest update? Are there features you were hoping for that weren't announced?